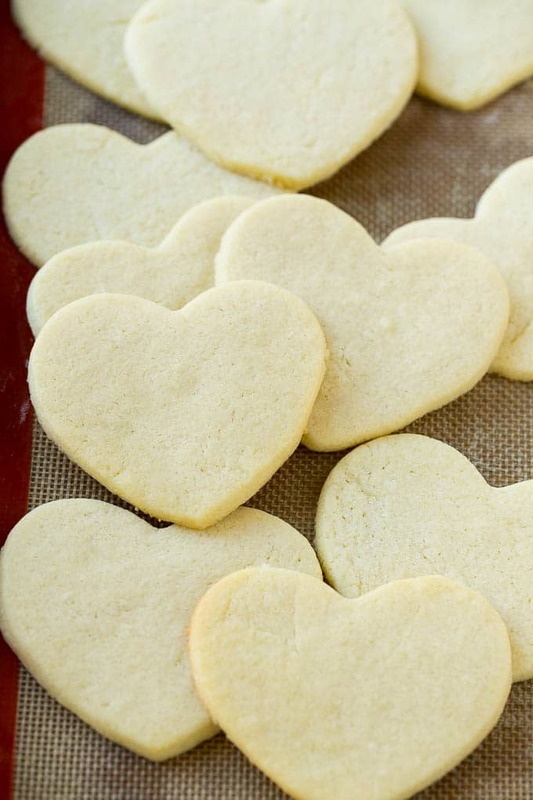 These heart cookies are the ultimate treat for Valentine’s Day! 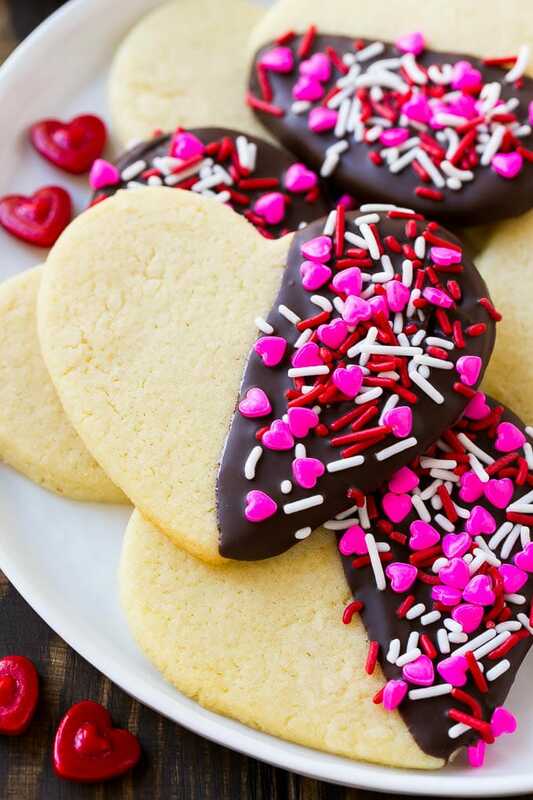 Heart shaped sugar cookies are dipped in dark chocolate and coated in festive sprinkles for a fun snack that’s perfect for classroom parties or that special someone in your life. These heart sugar cookies taste as good as they look! They’re great for packaging up and giving as gifts and they can even be made in advance. Valentine’s Day will be here before we know it, and at my house we’re celebrating with these adorable yet easy to make heart cookies! I’ve taken homemade heart shaped sugar cookies and given them a dunk in dark chocolate before adding a variety of colorful sprinkles. These cookies are great for classroom favors or to give to friends and family who deserve something a little sweet. This recipe starts with a basic sugar cookie dough, which is designed to hold its shape in the oven. The dough does need to chill before you roll it out, so plan accordingly. You can store the pre-made dough in the fridge for up to 3 days, or in the freezer for up to a month before you plan to bake your cookies. 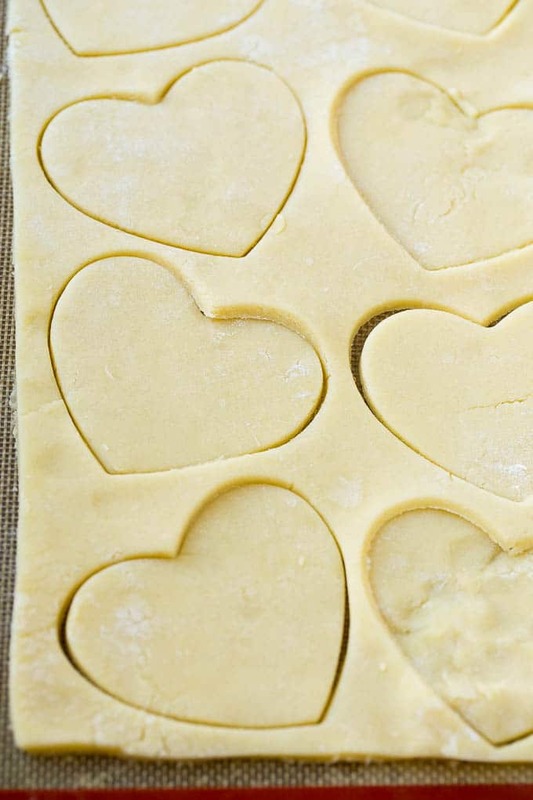 The dough gets rolled into a sheet before the heart shapes are cut out. I used a 4 inch heart shaped cookie cutter. You can make your cookies bigger or smaller if you prefer, just adjust the bake time accordingly. After the cookies come out of the oven, they’ll need to cool before you give them their final decorations. Sometimes if I need to plan ahead, I bake the cookies then freeze them. I simply thaw the cookies on the counter, then proceed with the chocolate dip and sprinkles from there. You can use chocolate chips thinned out with a little shortening or dark chocolate candy melts for dipping. I often get asked why I include the shortening, the reasoning is that it helps to keep the chocolate coating thinner so that you don’t end up with a super thick layer of chocolate on your cookies. When I make these cookies I typically use Ghirardelli Dark Melting Wafers for the chocolate dip, they’re available in the baking section of most grocery stores. The wafers melt perfectly and they taste just like real dark chocolate! The final step is to add your Valentine’s sprinkles while the chocolate is still wet – this is a great job for the kids! I bought a few packages of sprinkles at the craft store and mixed them together to make this Valentine’s blend, but you can use whatever you like. I typically package these heart cookies in little clear bags and tie them with a ribbon; my girls love to pass out these fun cookies to their friends at school! This Valentine’s Day, make something sweet for your loved ones like these festive treats, they’re sure to be appreciated by all! 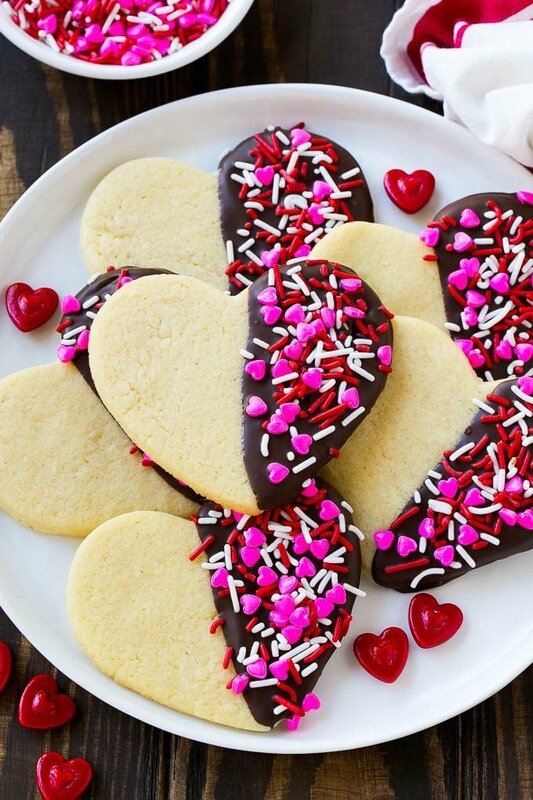 These heart cookies are the ultimate treat for Valentine's Day! 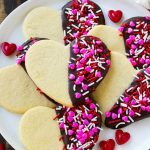 Heart shaped sugar cookies are dipped in dark chocolate and coated in festive sprinkles for a fun snack that's perfect for classroom parties or that special someone in your life. In the bowl of a mixer, beat the butter and sugar until smooth, about 2 minutes. Add the vanilla and salt, then slowly mix in the flour until thoroughly combined. Remove the dough from the bowl. Place the dough on a large piece of plastic wrap and shape it into a disc. Wrap the plastic wrap around the dough and chill for at least 1 hour, or up to 1 day before you plan to bake your cookies. Preheat the oven to 350 degrees. Line a sheet pan with parchment paper or a nonstick baking mat. Divide the dough in half. Re-wrap one half of the dough and place it in the fridge. Roll the remaining dough into a 1/2 inch thick rectangle. 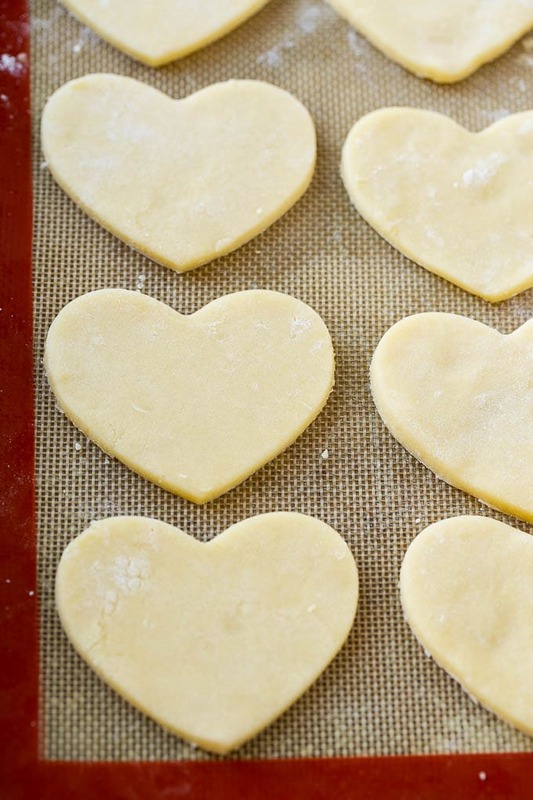 Using a 4 inch heart shaped cookie cutter, cut out as many shapes as you can from the dough. Re-roll the dough and repeat the process until you've filled your first baking sheet. Cookies should be spaced 1 1/2 inches apart on the sheet. Place the pan of cookies in the fridge and chill for 20 minutes. Bake for 12-15 minutes or until cookies are set and the edges are just barely turning brown. Repeat the same process with the other half of the dough that you previously put in the refrigerator. Heat the chocolate chips + shortening OR candy melts (no shortening needed) in the microwave in 30 second increments until melted. Stir until smooth. Dip half of each cookie into the chocolate, tapping against the bowl to remove the excess. Place the cookies on a sheet of parchment paper and quickly add the sprinkles onto the wet chocolate. Let set completely. Dough can be frozen for up to one month; thaw in the refrigerator before using. Plain cookies can be frozen for up to one month, then thawed and dipped in chocolate and sprinkles. Not sure how I am the first to notice, but how much salt?? I read the recipe through multiple times thinking I must be missing it but it isn’t there! Sorry about that it’s 1/4 teaspoon! Is there an approximate number of cookies this recipe makes? 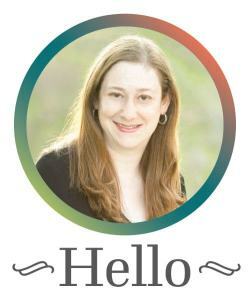 I’m making for a large group and want to know if I should double it. It makes about 24 3-inch cookies! Loved this recipe! Everything worked!